In 2003, when the $55 million renovation of the 744 Building at 744 Broad Street was completed by Cogswell Realty, Newark's then Mayor, Sharpe James, hailed the restored building as "a gorgeous showplace, recapturing its former glamour and former status." From atop its roof, a towering flagpole once again displayed a waving American flag that had been absent from that roof for 30 years. This is the story of that flagpole. As part of the building's restoration, Cogswell Realty had the long-dorment flagpole replaced with a new and taller flagpole made of reinforced steel in 1999. With the 744 Building already Newark's tallest structure at 465 feet, the new reinforced steel pole rose 113 feet above the roof line, elevating the overall height of the building and pole to 578 feet. Not visible from the building exterior, another 15 feet of the flagpole extended below the roof line into the building. The tapered pole, at its base, measures 16 inches in diameter. At its peak, it is eight inches in diameter. The 'golden ball' atop the flagpole is 18 inches in diameter and is made of aluminum, and is gold-plated. 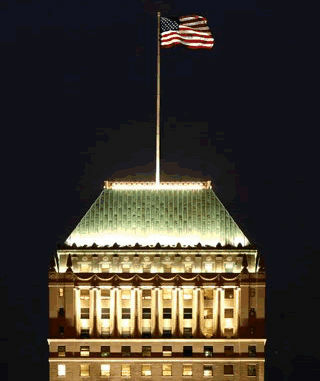 The American flag, at the time of the poles erection in 1999 measured 20 feet x 30 feet, making it Newark's largest flag. However, subsequently, two metal discs were affixed, one above the other, at the midway point of the flagpole, to serve as antennas for Newark FM station WBGO. This installation necessitated replacing the larger flag with one measuring 15 x 25 feet, so as not to interfere with the WBGO transmitters, one of which is analog and the other digital.